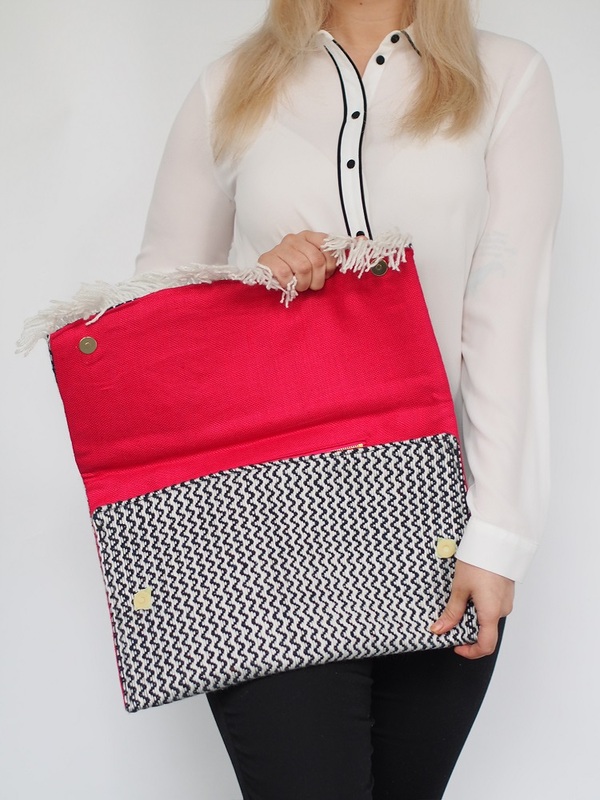 Handbag maker Valerie Taylor tells Donegal Woman how she rekindled her creative talents for a colourful new adventure. Valerie Taylor was in a textile room in Coventry University when she first laid eyes on a loom. It was covered in dust, unused for a long time, but she was curious about what she could make with it. She asked her university tutor to show her what to do, and soon her love of weaving was born. While studying Craft Design, Valerie chose to adopt the art of weaving to create lampshades and free standing lamps. That was around the year 2000. After graduating, Valerie moved into management and her creative talents fell to one side. “I forgot how much I loved it. Watching the fabric grow, and you’re the one who is making it grow. Every time I wind it on I know I’ve done a little bit more,” she tells Donegal Woman. It was only after moving back to Donegal and starting a family that Valerie decided to take up weaving again. She knew she had to follow her passion, so she left her job in a Letterkenny deli to embark on LYIT’s exciting new degree in Fashion with Promotion. 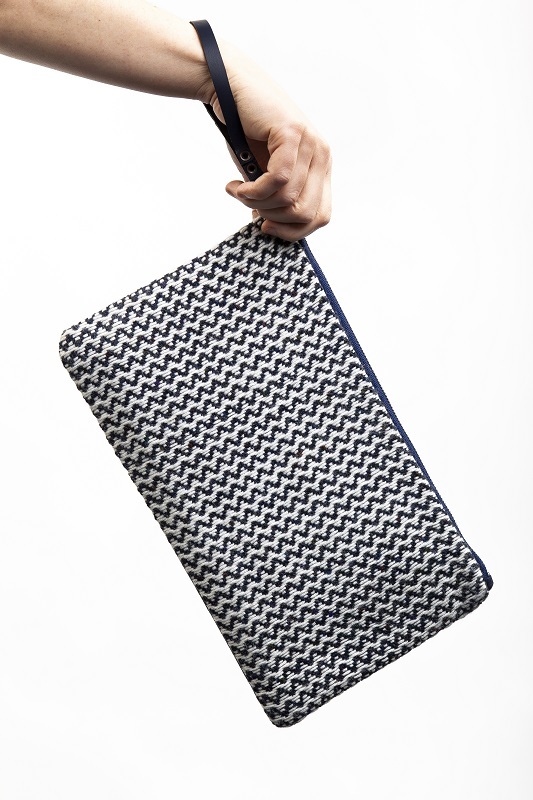 She now makes beautiful, unique and sustainable hand woven bags. 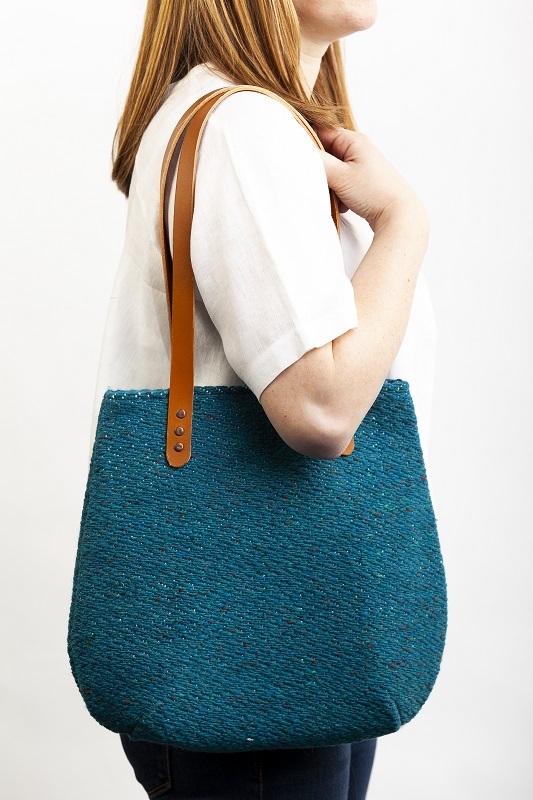 Valerie’s bags are made with only Irish yarns and fabrics. 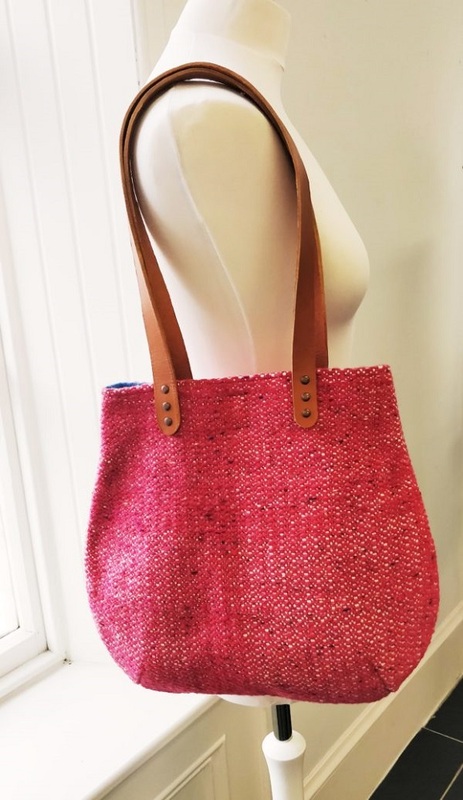 In her hand-woven pieces, the yarns used are from Studio Donegal – and her current tweed tote bags are comprised of Mc Nutt’s herringbone and tweeds from Donegal – and the linings are Baird Mc Nutt’s Irish linen in Ballymena. She prides herself on supporting local by using local. “We live in a county that has so much raw material on our doorstep, but you don’t realise until you go looking for them. “My motto is no wastage. I use McNutt’s fabric for a reason – everything I use is end rolls and I manufacturer everything myself,” she said. Donegal Tweed has a worldwide reputation for quality, and it’s a tradition that Valerie is keen to promote. She said: “Donegal was the hub of weaving back in the day. There is a group of us weavers now, but I don’t know if any young people are doing it. I’m trying to get my kids into it. Valerie naturally settled into making handbags, due to her love of the accessories. What she creates is much more than just a bag though, because every piece is part of a special collection. By using end rolls, there’s only ever a limited number of bags she can make in any one colour. Customers love the knowledge that they are getting original one-offs and that they are all handmade with love by Valerie. Donegal’s natural landscape has a big influence on Valerie’s work. Living in Legnahoory outside Kilmacrennan, she is surrounded by inspiration. “We live in a beautiful country, that’s the good thing about being remote,” she said. She’s not afraid to add a little boldness either. Now with an established brand, Valerie is keen to encourage others to follow their passion and pursue craft jobs. Valerie is currently selling at Above and Beyond the Warehouse beside Guildhall in Derry. She is also a member of Fashion Hub and this supportive community enabled her to showcase at Pure London in February – the UK’s leading fashion retail event. That’s all pretty impressive considering she only graduated with her Fashion with Promotion degree last October. Valerie was one of the first cohort of Fashion graduates inspired by lecturer Sharon Maxwell to build a brand. “I wouldn’t be here now, doing what I do, if it wasn’t for Sharon inviting me to do the course. As a mature student going back, the course was amazing. 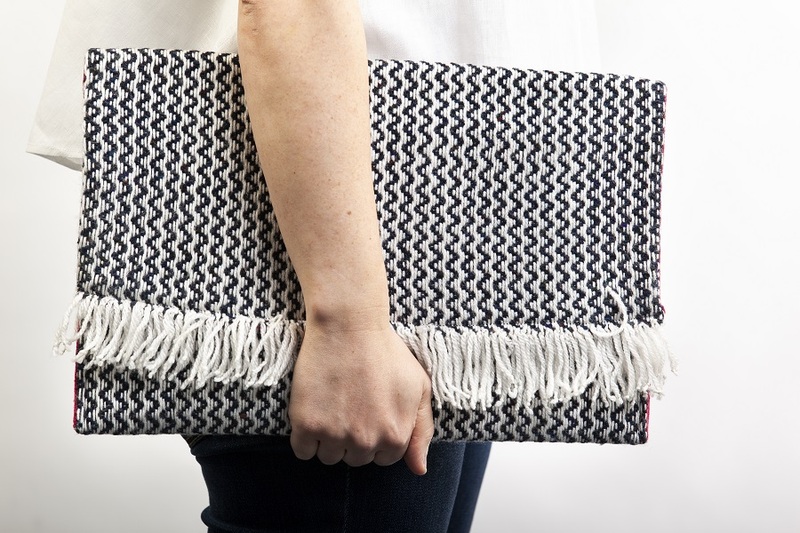 It gives you a real confidence boost and it got me back into weaving,” she said. 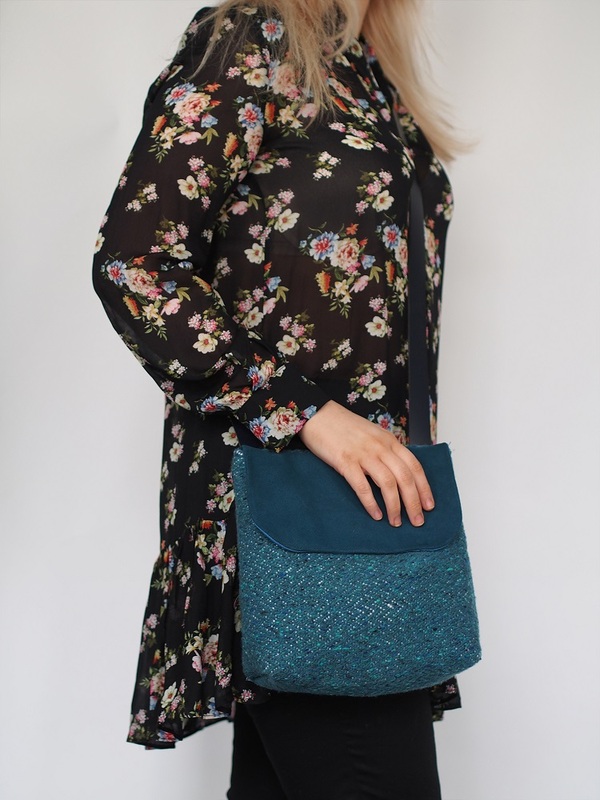 Following a busy Christmas and the excitement of Pure, Valerie is focusing on getting her bags stocked in more shops, spreading the word about her brand and keeping Donegal’s wonderful weaving tradition alive.